Oh...what a day...what a day!! 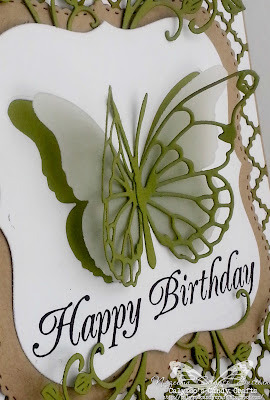 Today at Sweet Stamps, we have a fun challenge for you. I really love...I mean LOVE how this came out. This is a close up of the layers of the butterfly. I cut the Tesstina Border out of SU card stock and used the glue pen to add adhesive to the very, very small areas and placed it on Coconut white card stock by Bazzill. I then used Mini Pearl French Flair and cut that out of Bazzil Kraft and the stacker version of the die out of Bazzill Coconut. I LOVE these dies. I know they have been around forever but, they are new to me and I LOVE them. The butterfly negative is Darla Butterfly and Vivienne Butterfly by Memory Box. I used the Happy Birthday sentiment, which is by Sweet Stamps; another fave of mine and to finish it all off the Fanciful Flourish by Cherry Lynn Designs. This is one beautiful card... love love love it! 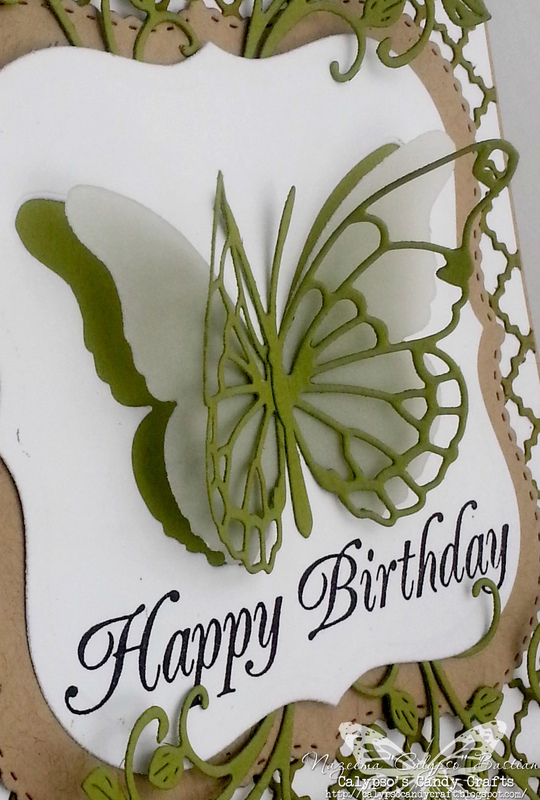 You've really made a gorgeous card using all those fabulous dies! Love it! wow this card is beautiful you should love it. I love it as well. Great job and thanks for sharing with us at Created with love challenges. WOW what a gorgeous card. I love your design with the layered butterflies, Tesstina Border and the stitching on the Mini Pearl French Flair. 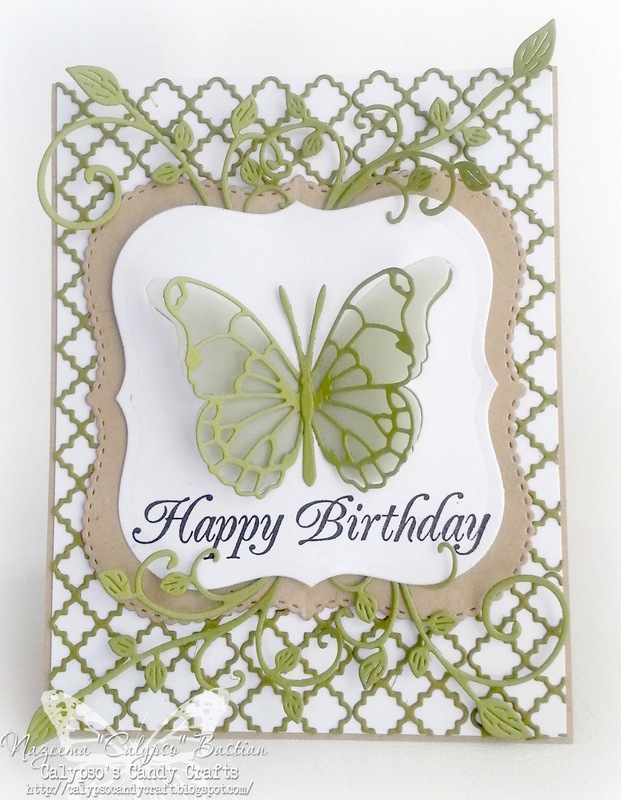 Beautiful card- love he pretty butterfly- love the great die cut background. Love your card, Calypso, thanks for joining PTT. Gorgeous! I LOVE The butterfly!! Thanks for joining us this week at Created With Love Challenges for our Anything Goes Challenge! Beautiful card, so elegant! Love your use of all the dies!! This is beautiful and elegant. Love the colors to! Thanks for sharing with us and playing in our neighborhood at 613 Avenue Create! Your card turned out beautifully. I love those dies as well and can't get enough of them. Thanks for visiting us at 613 Avenue Create and we hope you'll come back again. Very pretty and light like a feather. Thanks for joining us this week at Created With Love Challenges.